Friday’s here woohoo. We’re off to Hubby’s parents down London way and just about to set off. I always hate the 4hour journey, but enjoy it when we get there, and after the week i’ve had i’m looking forward to some down time, including afternoon sleeps and long park walks. I first thought the pattern on this dress was little umbrellas, but looking at it now i see they are flowers! Silly me! I also see that its a tad short! At 5’6″ and with a lot of junk in the trunk this dress is a little toooo teeny tiny. Perhaps leggings would be best and retire my “you’ve been tangoed” legs. I dont have many specs days these days, i’m an avid contact lens wearer, but with a mixture of hayfever and unbelievable tiredness i had to give my eyes a rest from contacts. I love that glasses are now “fashionable” and you can get some awesome frames, but i just dont feel right in specs, which is strange as i’ve had them since a teenager. I’m in such a rush, lots to do!! Have a wonderfully happy weekend lovelies! Um…I seriously need those tights! O I love the tights! They cover enough, you don't need leggings 🙂 Just go for it! gorgeous! i love the dress paired with the tights. and as for it being short…hey, you've got great legs, so show them off! have a great weekend! I love the dress Rachel – shame you got it in the sale as that means I can't go and buy it myself lol! Rachel you look great in this dress. I love the tights with the more subdued shoes and dress…delightfully adorable. dawn suitcase vignettes. Have a great time. I'm so happy you paired those marvelous tights with that dress. It's so unexpected but so perfect. Have a wonderful weekend! Gorgeous dress!! I thought they were umbrellas at first too! Those tights look fab with it. I'm so ready for the weekend as well! Have fun! cool 😉 love everything in this outfit 😉 i shop from those shop also. What a super cute print! These colours suit you so well, and I love how you've paired that bright red colour with the softer tones! have a fun weekend! 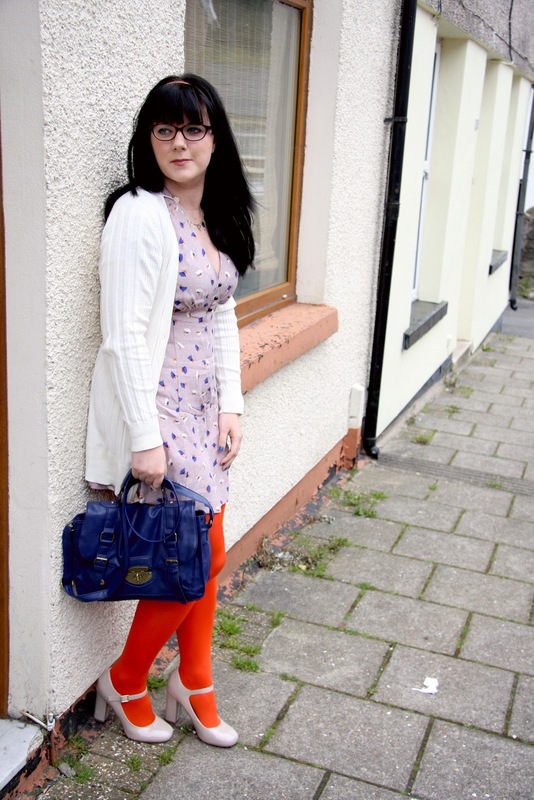 I love the orange tights and that adorable dress, Rachel! you look great with those outfit.. i love them all!! Oh how I'm missing tights & cardis right now! I love your orange tights with this dress, so cute. I think it looks perfect on you! That dress is gorgeous on you! Love how you can pull of the vibrant colours with your tights, I can imagine the looks I would get here (small outback Australian mining town) if I wore them! They already look at me funny as it is!